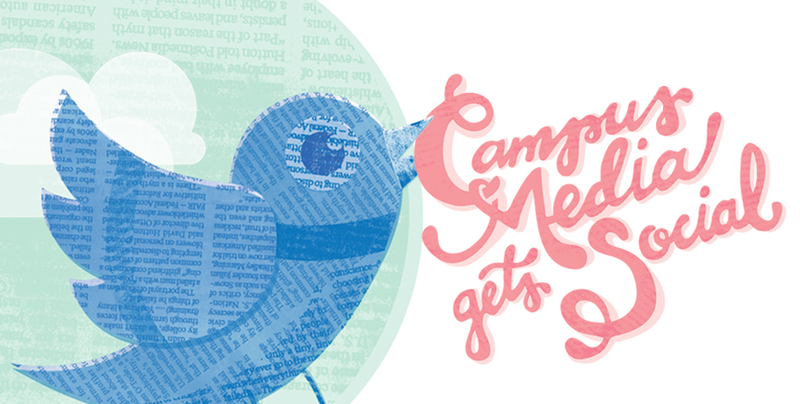 Tweet it, retweet it, like it or favorite it — however you want to spin it, social media is proving to be a game changer in student media. That’s because student journalists have been using social media for years. Tapping away endlessly on our iPhones and laptops, the process of sharing our thoughts and connecting with followers has become part of our daily lives. And with obsolete business models struggling to find profit in print, social media expertise is becoming an increasingly crucial part of a journalist’s skill set. “When a student journalist is getting on social media, it’s something that they’re passionate about and want to experience,” says Andrew Bates, former Managing Editor, Web at the University of British Columbia’s The Ubyssey. That’s why close attention should be paid to student media, as it makes up the very demographic that’s soon poised to take over the journalism industry. Social media is tailor made for a generation of young journalists who have grown up in a wired landscape, so their efforts can tell you a lot about where the industry is headed. Take The Gateway at the University of Alberta, for instance. As Multimedia Editor during the 2012-13 publication year, I was at the helm of a significant effort to enhance our social media presence. Updates on our Twitter and Facebook accounts were initially sporadic at best. Working as News Editor the previous year, I was frustrated over our lack of updates on newsworthy items, so I decided to do something about it. Once I jumped into my new role, I made it a priority to deliver daily social media content. That largely came through scheduling dozens of tweets and Facebook posts every week to go out at regular intervals using the social media management system Hootsuite, as opposed to merely posting chunks of articles at once — a common pitfall among smaller and inexperienced media organizations. Bates aptly calls this form of social media management a “production task” that requires consistent content and engagement with followers. Facebook and Twitter are primarily meant for distribution and getting eyeballs on the content, he says. This process of information sharing is only amplified in student media, which delivers content for students by students. Using these new methods of engagement often translates into great potential for reader loyalty. But what’s setting campus media back on their social media efforts is a lack of money and resources, Hudson says, a point that Bates echoes. “Essentially, to do social media well as a student paper, you have to have [online] as an organizational priority and pay an individual person to do it,” Bates says. The Gateway did just that in hiring its first Multimedia Editor in 2012. By the time my term was over, the paper’s Twitter account boasted more than 3,500 followers — double the amount from the previous year — along with a 110 per cent increase in web traffic from the previous year. Concordia University’s The Link has seen similar increases in Twitter followers and Facebook likes thanks to its rigorous social media efforts. Corey Pool, the paper’s Online Coordinating Editor, says there’s a lot more wiggle room for student media to experiment with social media. “If it works, it works. If it doesn’t, we scrap it,” he says. Pool will often use colloquial terms, for example, and initiate a discussion as opposed to posting formulaic headlines and links. Student papers are fairly nimble in that respect, Pool says. He points to the 2012 Quebec student protests as an example of where student media was faster than traditional media outlets partly because of social media. It’s a point that Hudson can attest to, having spent much of her time as News Editor covering the strikes through social media. “The reason that student media is so well positioned to use social media,” she adds, “is because student media are going to be the ones who wait around for three hours until that staff employee got arrested. It’s this kind of freedom that gives the student media a prime opportunity to shape the way social media is being used in journalism. And, as Pool notes, now is the opportunity for student journalists to effect change before moving on traditional media themselves. The speed at which “news travels” is almost too quick. This puts more emphasis on having journalists report error free and mistakes are broadcast immediately leaving very little time for a correction. Certainly lots of pluses but the changing landscape of shared media needs a lot more attention than in predecessors.